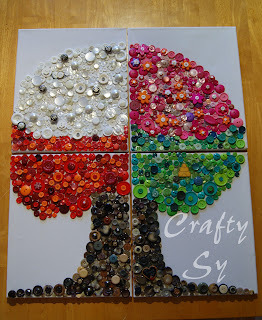 I wanted to share this original idea with everyone ♥ There is no tutorial for my Button Tree..however you can use the one for Button frames http://craftysy.blogspot.com/2012/01/button-frames.html and it is the same basic idea. This is made on four large (10x14) canvas'. It's my seasons tree..Fall into Winter, into Spring, into Summer. Look closely..little neat buttons are hiding everywhere! This is very easy to do..but it takes a LOT of time. This project took me nearly 6 hours..and a lot more buttons than I thought it would!! But is it worth it? Well you tell me!